You are here: Home / Questions? What is Coachman’s Delight Online Learning? Online training courses are live, interactive classes in which you to see my computer screen and webcam as I share graphics, photos and video. You get to ask questions as the class progresses, so you can be certain to understand the material. Additionally, you receive goal oriented lesson plans, that you can print out and bring to the barn to put your learning to use the very next day. Check out Available Classes. Online Now Classes are classes which are currently available to view online. They include all the same great content of the live classes, including downloadable lesson plans and articles. The class recordings combine recordings from the live class as well as other recordings. Check out Available Classes. One of the best things that you can do to improve your skills, and advance your horse’s training, is to approach the work you do with a plan in mind. Lesson plans help you plan that work, giving you step by step instructions for building specific skills. These lesson plans are an invaluable tool for an equestrian at any level, from the rank novice to veteran trainers. I’ve been writing for more than a decade about everything from training strategies, to being a better student. Articles break complex subjects down to explanations that don’t require a dictionary to understand. Get a better prospective on everything from basics of horsemanship, equipment, competition, and training techniques in my articles area. How do I know if I’m registered for the live class? Upon completing your order you’ll land on a screen that says “Order Received” at the top. Your online class will show up in the “Order Details” You can also view that order under the "Order History" tab, if you're logged in to CoachmansDelight.com. 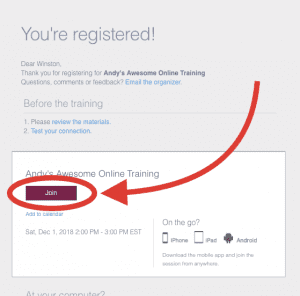 If you see a button that says "Join Now", it's a pretty good indication that you're registered for the live class. You can click that button, any time you want, but you'll get a page that says "Come back later." if the class hasn't started yet. You will also receive an e-mail confirmation generated by GoToTraining (customercare@gototraining.com). It will have the subject line: [Class Name] Confirmation. That e-mail will also have a "Join" button that you can click to access the class. You will also get a reminder e-mail for the class 1 week, 1 day, and 1 hour before the class. If you do not see any of the things described here, please contact me at least 90 minutes before the class to be sure that we get it sorted out. How do I join a live class? 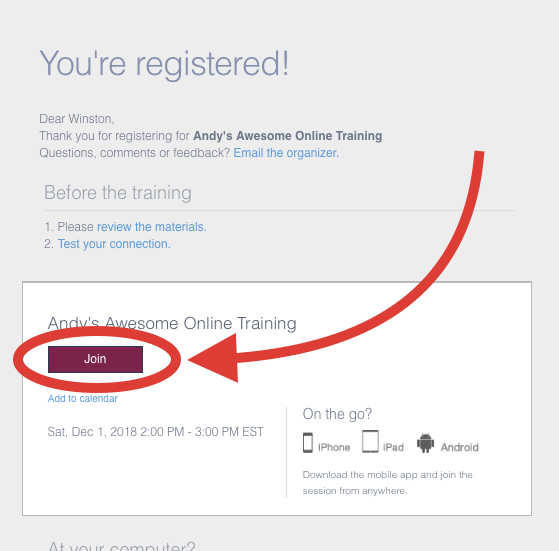 Sample Description Your confirmation e-mail and all of the reminder e-mails from customercare@gototraining.com will have a purple button labeled “Join”. Simply click that button before class starts. The class is usually open to join about 30-45 minutes before the scheduled start time. It’s a good idea to sign in early, even if you’ve successfully connected to previous classes. That way, if you experience any difficulties signing in, you have time to sort it out before class starts. What are the computer requirements to join a live class? Take a look at the available Online Classes in the Online Learning section of the website. Click the class to find out more information. When you find one that you're interested in, just add the class to your cart. You'll be registered for the class when you checkout. Do I have to attend the live class session? No. In fact many people prefer to view the classes on their own schedule. You’ll be able to download the recording and materials to your computer up to 6 months after you signed up for the class. Once they are on your computer, they are yours to keep and view any time you like! How do I view the class materials and videos? When you purchase a class, an account will be created for you here on CoachmansDelight.com, and your class will be added to the "My Classes" tab that will appear in the the secondary navigation menu. You can view the class any time you want, so long as your logged in to the account you made the purchase from. Can I sign up for a class after the live class is over? Yes! Some past classes will be available for a limited time after they've been held. So if you missed a class, head over to the Online Classes tab and sign up. Just bear in mind, the time those classes will be available may be limited, so don't snooze on it! You'll have access to the class page, and all of the materials on it for 6 months after your purchase. When you download video or materials to your computer, they're yours to keep for as long as you like. I recently attended the online course about the half-halt. So far I have been unable to download the corresponding articles, so I can study them. Are they ready to download and print? Thanks for signing up for the class. You can always access any classes you’ve signed up for by logging in. Once you’re logged in, click on the ‘My Classes’ tab in the secondary menu. That will show you the classes you’ve signed up for. Click on the class you’d like to view, and all of the course materials will be there waiting for you. As a side note, I also send an e-mail to all those who’ve registered for the class when class page is completed. If you didn’t see that e-mail, look for andy@coachmansdelight.com in your junk mail folders. Thanks for sharing your story. I’m glad you found driving! I would recommend that you go ahead and signup for the Long Lining 101 class because it will likely give you some tips and tools that may not have been part of your training in the past. Sure, much of it will be review for you, but it never hurts to review the fundamentals. Even if you pick up just one or two little pieces or techniques that you didn’t know about, it’s worth it. 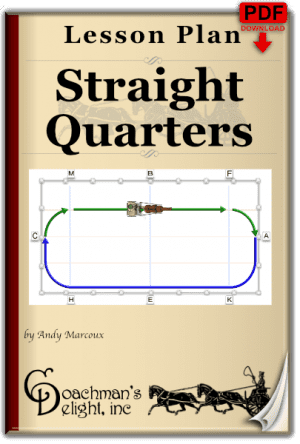 If you want a really challenging long lining lesson that will give you a good foundation for doing lateral work, check out the Long Lining the Wave lesson plan. That lesson plan focuses in on lateral flexibility and managing contact through a complex figure on the long lines. I will be working on a “beyond the basics” long lining class to followup the 101 class in the future. I’ve been driving sinc the late 1960’s and recently had my first runaway. I believe you mentioned a class or booklet on this subject , but can’t find it on the website. I’m very interested in your opinions on the subject. Sorry to hear about your troubles! Next week’s class is Drive Past the Spook, which is sort of the pre-cursor to the Run Away class. In short, many of the tips and tricks in the Spook class will help people avoid getting into the a runaway situation in the first place. The Runaway class will be up for a re-do in late January or February. I’ll be certain to let everyone know about that through my newsletter, and with a post here on the website. Andy, the pony I drive becomes frozen when she spooks, which although far preferable to bolting, rearing, spinning or many other responses, is something I’m really struggling to overcome with her. Is the “superglue-response” covered in Drive Past the Spook? Ah yes, I am quite familiar with the “superglue response.” The short answer is that you’ll need to use your connection through the bit to get her to continue confidently forward. It may seem counter-intuitive to take a firm hold of the bit when the pony has stopped moving forward, but it helps direct the pony toward a better response. The pony is giving you a form of spook known as “balking.” As you say, it’s far preferable to spinning, rearing, or bolting, but can be frustrating none-the-less. It’s common when approaching a water crossing or similar obstacle. To answer your second question on this. Yes, I do cover this in the “Driving Past the Spook” class. Hello Andy! Do you still offer individual video lessons/consults? I certainly do. All you need is some good video, and we can do a 1 on 1 online meeting. 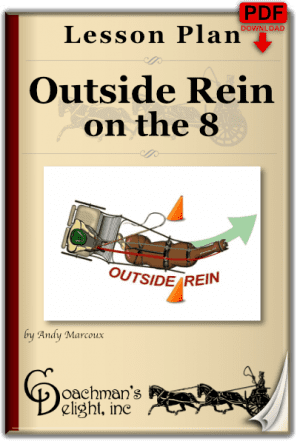 Do you have any lesson plans for reining the four in hand and tandem? I have my rein board and would like to learn and practice the reining technique before moving up from pairs. I now see I need to strengthen me left hand. Rein board with four 2.5 # weight is a lot on my left hand. I don’t have anything written for that yet. It’s quite possible that I’ll get something together over the winter as I work on some of the reinsmanship classes. In the mean time, you could see if you could find a copy of “The Art of Driving” by Max Pape. That’s one of the better references for handling tandem & 4-in-hand reins.